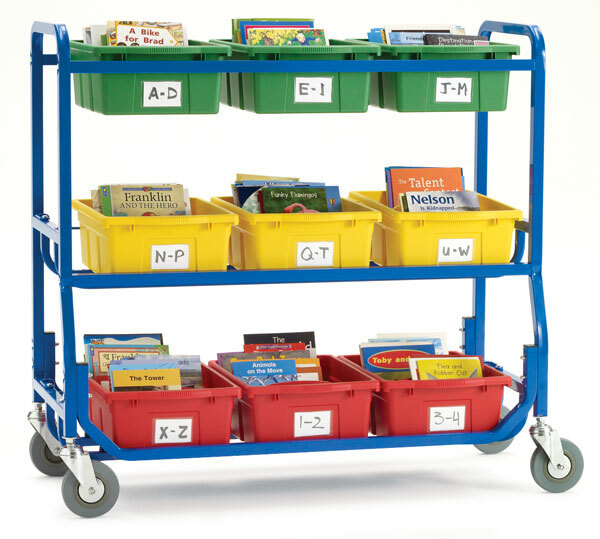 This sturdy cart is ideal for programs that require books to be moved — either around a school or within a school library. Measuring 40"H × 43"W × 18"D (102 cm × 109 cm × 46 cm) the Copernicus Library On Wheels features a hefty 1" (2.5 cm) diameter steel frame and four 5" (13 cm) heavy-duty casters (two locking) for durability and mobility. 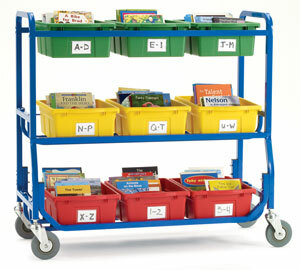 The Copernicus Library On Wheels includes nine large, divided book tubs measuring 15"L × 12"W × 6"D (38 cm × 30 cm × 15 cm) with adhesive labels. It features a lifetime warranty on the tubs and a 10-year warranty on the frame. ® Copernicus is a registered trademark.™ Library On Wheels is a trademark.